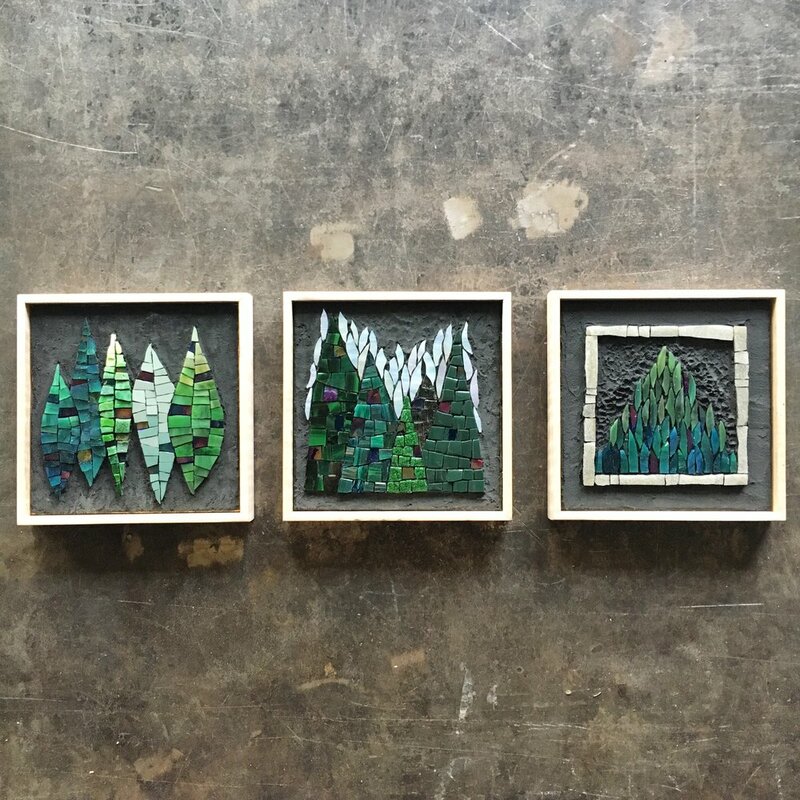 Nature Therapy is the second mosaic series Johannah completed over the summer. If you haven't read about the first set, Domestica, you can catch up here. Next month you can find both series at Gallery Flux in Ashland, VA for their 6th Annual Miniature Show, opening November 30. Nature Therapy started with what is, for me, the ever-present siren call of art subjects, nature. Whether it's to remind myself of the everyday beauty that surrounds us, or to connect with others so they might more strongly feel the call to protect our environment, nature is a subject that is at the heart of who I am and what I do. Like Domestica, this series was an unplanned, spontaneous journey. "Leaves" was the first piece to arise, driven by a need to create something green and lush, and inspired by my talented friend Emily Herr's Thrive series, especially some of the leaf shapes in this piece and the colors in this one. "Trees" and "Mountain" came next, designed with the simple, graphic shapes and similar color scheme of the first piece. As with all unplanned journeys, this one took me to unexpected places. When I got to the end of this series, I realized that the point-of-view moved further out with each consecutive piece, from leaf to tree to forest. As I worked on this series, I thought about the idea that time spent in nature heals and nurtures us, even nature viewed through a window. And like Domestica, the political climate had me thinking of the inequities of this idea, the fact that access to nature has become a privilege for some rather than a right of all, that the lives of some populations are unduly burdened by their lack of access to clean nature. So a portion of the proceeds from the sale of this series will go to Green for All, whose mission is to build an inclusive green economy strong enough to lift people out of poverty.